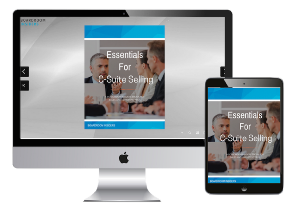 Join over 3,000 sales pros when you download this ebook! Most sales leaders aspire for all of their key account managers to have relationships in the C-suite. Whether or not they control the purse strings, CXOs are important influencers. Making them aware of how your company is helping drive their business forward is a no-brainer. When budgets get cut, if you have not demonstrated how your offer lines up with their priorities, you could find your business in jeopardy. Plus, even with all the technology and tools that salespeople have at their disposal, sales is still about trust. Building and nurturing relationships at the highest level within your key accounts gives you an edge over the competition that will be hard to replicate. “When I look at our largest transactions…every transaction was done with the CEO… that’s why we’re really selling more enterprise software than Oracle or SAP.” Salesforce CEO Marc Benioff on the company’s “all time high” number of large, enterprise deals. Doing your homework on your customers is always the first step to relationship building — especially when approaching executive decision makers. One of the most successful business people of all time, Warren Buffett, takes a very simple and disciplined approach to dealmaking. According to Tom Searcy's book, "How to Close a Deal Like Warren Buffett--Lessons from the World's Greatest Dealmaker,” Buffett uses basic research and insight to "sell" his deals, often winning out over competitors offering better terms. Profile Your Buyers — We sell to people — and people are irrational for different reasons. It's not enough to know the facts, have the best ROI or most effective solution. If you do not understand the individual motivators of all of the members of the buyer's group, he says, you are flying without the right instruments. Do your homework — When Warren takes a meeting, he doesn't ask about industry, market, competitors or advantages. He already knows them. He believes asking these questions demonstrates a lack of preparation. Buffett thinks about all the angles, including whom —not just what — he is selling. " We love LinkedIn and believe it to be an essential business tool. However, if you are an enterprise sales or marketing pro focused on C-Suite selling, LinkedIn is not a silver bullet. 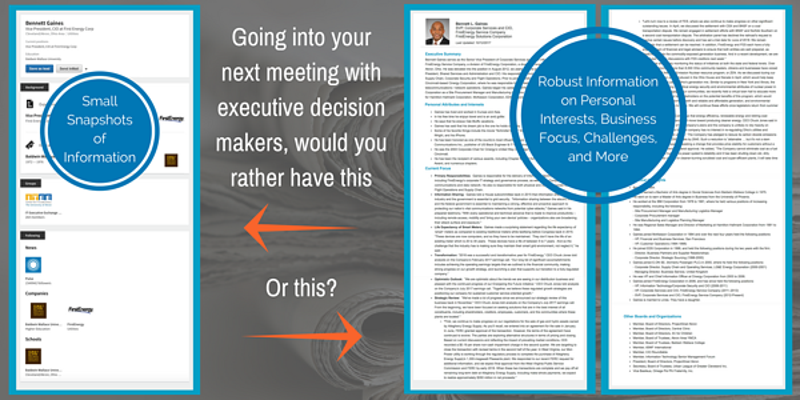 It simply does not provide the insight required to engage a Fortune 500 key decision maker. In fact, LinkedIn can give you a false sense of security going into important meetings. You think you have done your due diligence by looking at a few LinkedIn profiles, but halfway through the meeting it can become painfully apparent that you don’t know what you don’t know. What the executive’s company or division does. While some people include this information in their profiles, many do not. Functional Responsibilities. Many people just include their titles without saying what they are actually responsible for. So if you are looking for the person responsible for digitization how do you know you have the right person? A title doesn’t always tell the story. Personal attributes, interests, and passions. While some executives post their hobbies and interests, most do not. The CXO’s current strategy/objectives/priorities. Has the company announced a sweeping cost-cutting initiative? Are they consolidating vendors? Do they have a blank check for cyber security? These are three examples of real initiatives at real companies. How helpful would it be to know these things going into a meeting? And how dangerous would it be to go in not knowing these things? What the person has said. Senior executives give interviews and some participate in quarterly earnings calls. Do you know what they are talking about? There is no better way to get an executive’s attention than to use his own words. This shows not only that you have done your homework, it demonstrates a level of interest and due diligence that most vendors lack. Are you going to get this from a LinkedIn profile? Current operating environment. Has there been an executive shakeup? A reorg? Layoffs? An IPO? A product recall? A merger? A new boss who plans to shake things up? All of these things could impact your deal, so you should know about them. We love LinkedIn. But it’s just a starting point. If you really want to make a favorable impression with deep insight into an executive’s priorities, challenges, and interests, you’ll need more than LinkedIn. While LinkedIn is one of the dozens of sources we use to prepare Boardroom Insiders Executive Profiles, we research everything mentioned above that LinkedIn is missing. LinkedIn is an essential tool, but the profiles are unpredictable, limited in strategic insight, and biased. Boardroom Insiders is rich with strategic insight, unbiased, and provides the full professional story of the key decision maker you are calling on. Top sales pros unanimously agree that customer intelligence is a critical element of sales call preparation. But faced with a digital avalanche of info and so little time to consume it, how much is the right amount? Too little (e.g., a quick glance at the company's website) and you feel unprepared. Too much (an inch thick stack of reports and articles) and you're headed down the proverbial rabbit hole--and there goes your weekend. Top sales pros tell us they leverage company-provided tools such as Factiva, Hoover's, OneSource and others to get their industry and company intelligence. But when it comes to executive intelligence, they typically gather their own information through Google searches--and sometimes they don't get to it at all. For “A” performers, knowing the priorities of a decision maker is a must-have. And making an executive sales call without knowing their careabouts, likes and dislikes can be like walking into a minefield. We’ve heard horror stories: for example, a jargon-spouting sales rep fumbled his way through a meeting with a leading technology executive who had repeatedly told the industry press how much she hates jargon. Highly irritated with his approach, she cut the meeting short. Ouch! We created Boardroom Insiders to prevent this from happening. 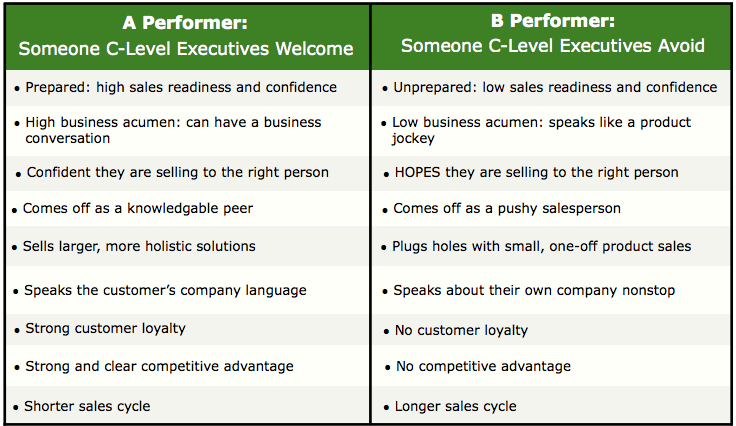 We help you avoid sales gaffes by filling the critical executive intelligence gap. Companies like DXC Technology, DellEMC, VMware, Citrix, CA Technologies, Box Inc., Medallia, and Atos, hire us to provide information that helps them close bigger deals, faster. Whether you do your own homework or get it from us, understanding the careabouts of the people to whom you are selling is a no-brainer. The FIRST thing to remember if you are trying to engage a C-Level executive is that they are unimaginably busy. They are also surrounded by people (gatekeepers, in sales-speak) whose sole function is to filter out any "noise" unrelated to the executive's top business priorities. The SECOND thing to remember is that you are “noise” until you prove otherwise. Following these simple do's and don'ts will help you rise above the noise and demonstrate worthiness, increasing your chances of successfully getting the attention of a C-Level executive. Then the call comes: The executive has agreed to meet with you. 1. Lack of Knowledge: Who is this person? What do they care about? Why did they agree to meet with me? What are they expecting from me? 2. Lack of Confidence: This is intimidating! My boss expects me to "have a business conversation" but I don't feel prepared. How can I connect the dots between this person and what I am selling? 3. This is Your Only Shot: This is a rare opportunity. If I don’t immediately demonstrate value, the meeting could get cut short — and I won’t get a second chance. The fate of the account rests on this one meeting! In this day in age, face-to-face meetings are becoming a rarity. This can be an obstacle to building loyalty and relationships with important customers. Companies often use events--such as industry trade shows, sports sponsorships, and user conferences--to get face-to-face with their biggest accounts. Given the cost of sponsorships and events, it is important to make the most of these opportunities. A small investment in executive insight can go a long way in maximizing return on event investments. Knowing something about your customers before they arrive--and engaging them before they get to the event--speeds up the "ice breaking” and helps you get down to business faster. With this in mind, we offer five tips for using executive insight to make your customer events more effective. 1. Get the right people to attend your event. You can avoid the last minute "get butts in seats" scramble by proactively making a wish list of the top companies — and individuals — you want at your event. Write them a personal email well in advance that directly connects your event with something they care about. 2. Use insight on desired attendees to drive content strategy and speaker selection. 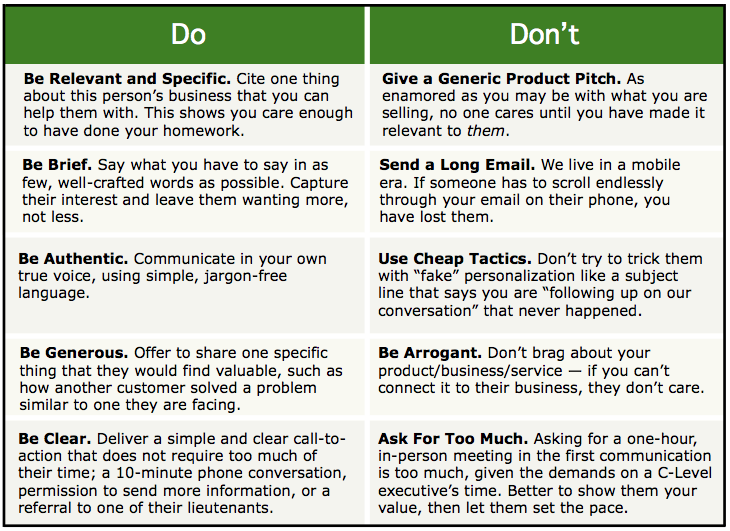 Once you know who you want at the event (see Tip 1, above), research what they care about and who they know. Let this insight guide your topics and speaker selection. Example: One customer learned that their target attendees (CIOs) were struggling with how to work effectively with CMOs. They used our database to find one executive who had held both CIO and CMO roles at Fortune 100 companies--the executive equivalent of a needle in a haystack! He was the perfect person to deliver their event keynote. 3. Tell customers what they have in common. One of the biggest reasons people go to events is to network with their peers. If you can tell them who else is in the room and what they have in common, you help support and facilitate networking, which attendees appreciate. Example: During their opening keynote, one customer showed graphics and statistics about the audience in the room--where they come from, top colleges attended, top hobbies, top concerns, and initiatives, etc. as well as key quotes and photos of select attendees. They collected the information from our profile database as well as from a pre-event survey. 4. 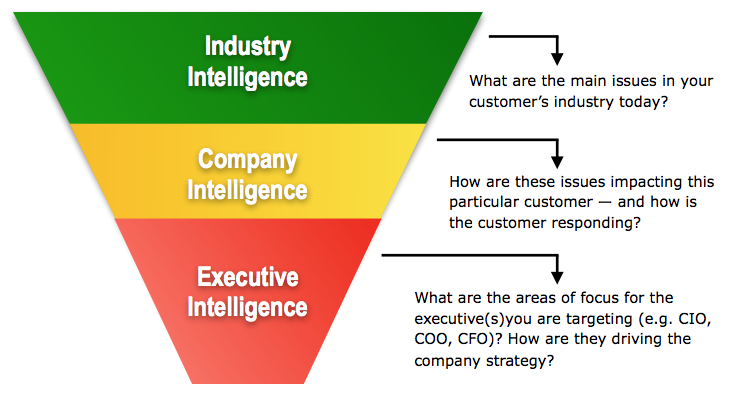 Use insight for customer matchmaking. Use specific insight to help set up meetings between customers who share similar initiatives and challenges. This will help establish you as a credible, valuable partner who understands their business--and it will give them more incentive to attend your event. 5. Create a customized, VIP experience for key accounts. Huge industry trade shows put a lot of demands on an executive's time. Avoid the temptation to push your customers to every single activity your company is doing; instead, learn about what they are focused on and design a thoughtful, relevant, customized experience. Example: One customer offers a VIP booth tour for key accounts at all of their most important industry trade shows. Sometimes they even do it during off hours when no one else is in the booth so they can have customized digital signage, special presentations, demos, executive meetings, and refreshments. The Boardroom Insiders database contains over 16,000 profiles on VP’s and C-Level executives of Fortune 1000 companies. • Our U.S.-based team includes former business journalists, industry analysts and management consultants, each of whom has a minimum of 10 years experience. • We maintain a rigorous editorial training program and employ a proprietary research methodology. • Each individual profile represents an initial 6-8 hours of research by experienced researchers. • We invest many hours in updating profiles after initial publication; many are maintained for years. C-Level Intelligence you won't find anywhere else. Boardroom Insiders is the ONLY business intelligence tool designed exclusively for B2B sellers, marketers and recruiters who need to reach, engage, and build relationships with C-level executives. 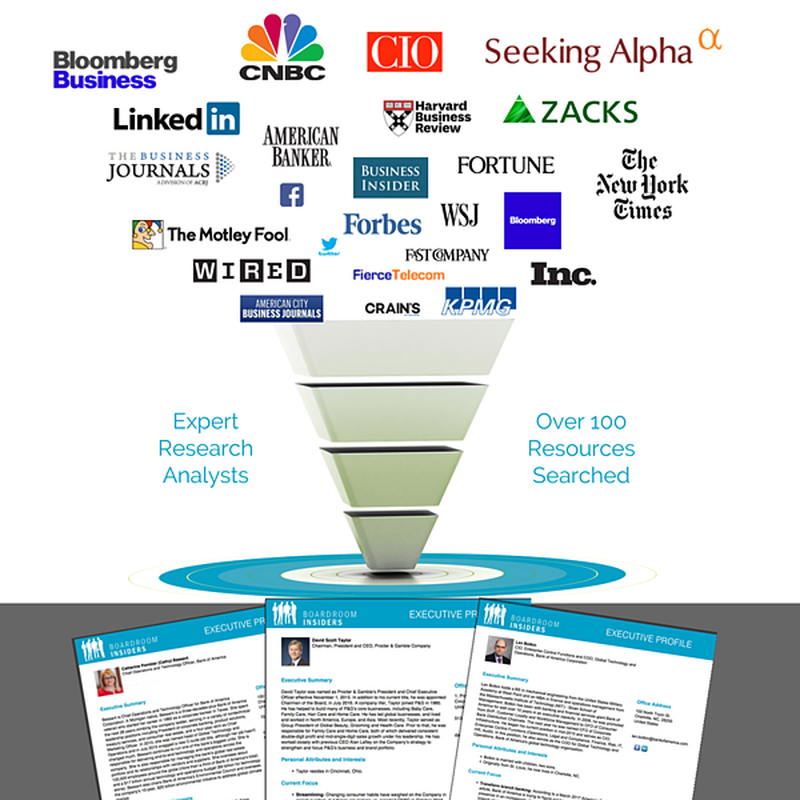 Our proprietary executive profile database supports large-account ABM, enterprise sales, account planning and management and executive search. Founded in 2008, Boardroom Insiders is based in Fort Mill, SC and San Francisco, CA.